Matt Dillon helps himself in the drugstore. A story about a group of junkies in 1971 who rob drugstores and get high… Then they rob some drugstores and get high and finally, for variety, they rob some more drugstores and get high! Led by neurotic Bob Hughes (Dillon), a veritable poster-boy for addiction, this oddball quartet consistently evades the law (an on-form James Remar) and moves from place to place always looking to knock off the next big pharmacy in search of a hit. Drugstore Cowboy is by far, 'Goodwill Hunting' director, Gus Van Sant's best movie to date, it's a very realistic portrayal about people so preoccupied with running the race that their relationships with one another become strange and distant, one which examines the psychological, emotional and physical demands of being alive in modern society… it's not so much a drugs film as it is a movie about everyday life. Whereas films like 'Trainspotting' and 'Fear And Loathing In Las Vegas' were criticised for accentuating the highs, and making the lows too surreal for everyone to understand, 'Drugstore Cowboy' is a movie which shows both good and bad with equal savoir faire, it's non-judgmental tone and unflinching look at the character's lives, means that it's still on the cutting edge of independent cinema, and a testament to my view that Matt Dillon only does good movies. Matt's performance in this movie is excellent, he plays the amiable addict with a subtle mixture of dry humour and an initial undertone of duplicity which becomes reflection and genuine, quiet repentance, all credit to Kelly Lynch as well, who gives a career best as Bob's wife Diane; Lynch plays an essentially unsympathetic character, whose gradually seen to be as detached, if not colder and more dependant, than her superstitious husband. 'Drugstore Cowboy' would've been too downbeat just as a movie about people orchestrating their own destruction / salvation, so Van Sant does well to exploit the crazy comedy of James Fogle's well written book; first there's Bob himself, who lives by some rather strange rituals; one of which involves never mentioning dogs (for Bob and Diane's first one led the cops to their house), looking at the back of a mirror or having a hat (especially placing one on the bed). The ending was a little too ambiguous for my liking, but the voiceover more than made up for any shortcomings as it was about things coming back; the strange and sometimes disturbing nature of redemption, how do we make things all right and when do we know that everything we've done no longer matters? Trust me when I tell you, this is one head-trip which makes 'The Matrix' seem easy. 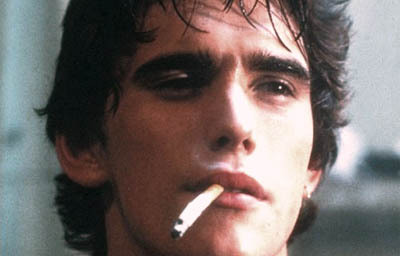 The best scene in the movie for me, was when Matt Dillon describes the circle of addiction in an unforgettable and hilarious way: "To begin with, nobody, and I mean nobody can talk a junkie out of usin'. You can talk to them for years, but sooner or later they're gonna get hold of something. Maybe it's not dope, maybe it's booze, maybe it's glue, maybe it's gasoline. Maybe it's a gunshot in the head. But somethin'. Somethin' to release the pressures of their everyday life… like havin' to tie their shoes." Many critics thought that casting William S. Burroughs (wrote 'The Naked Lunch' and 'Junkie') as an addict who used to be a priest, was gimmicky, for having a prolific drugs author in a movie about drugs is kind of like Scream-style post modernism, but I reckon it's best not to think of him as William S. Burroughs, but just to take his character on its own, for he's there to show that not all addicts are unemployed, young stoners with nothing better to do, but that the reigns of dependency are swung over every aspect of society. He represents a future for Bob and knowing that he "…must've shot a million dollars up his arm" makes him out to be some kind of a walking ghost, whose relative indifference to the problem presents us with a whole new way of looking at the issue, a far cry from the frenzied paranoia of 'Reefer Madness' nor as colourfully upbeat as Ted Demme's 'Blow' or Paul Thomas Anderson's 'Boogie Nights'. 'Drugstore Cowboy' is that rarest of things, a well made, almost impartial film, in which the acting and directing are so real you occasionally feel as if you're watching a documentary, a movie which defines itself though the message: "…the toughest thing is learning to live with the uncertainty: "Most people don't know how they're gonna feel from one moment to the next. But dope fiends have a pretty good idea. All you gotta do is look at the labels on the little bottles" Class-A. A masterclass in realistic writing, acting and directing. Addresses important issues, which are still relevant now. The film's message could be misinterpreted.